Rè nan 4-6 seachdainean ron gnàthachadh thòisich mi cuid de cho-dhùnaidhean a dhèanamh mu chruth na h-obrach deiseil. Nochd dà chuspair bunaiteach dhomh: B’e an dàn Chat a chiad fhear a chaidh a sgrìobhadh le Mohammad XXXX, fògarrach à Siria. Bha sin agam ann am Beurla, Arabais agus Gàidhlig. Bha mi airson na beachdan a sgrùdadh ceangailte ri call cànain nuair a dh’fhàgar pìos fearainn dha nach bithear a’ tilleadh a chaoidh. Bha mi a’ sìor dèanamh ceanglaichean eadar suidheachadh fògarrach agus suidheachadh nam fuadaichean is foghlam nan Gàidheal tro mheadhan na Beurla. Bha mi fortanach eòlas fhaighinn air buidheann de dhaoine le diofar chreideamhan ann an Glaschu agus fhuair mi cuireadh gu tachartas sòisealta aca ron Nollaig. Thachair mi ri corra teaghlach agus fhuair mi cothrom bruidhinn riutha. Leugh mi a’ bhàrdachd anns a’ Ghàidhlig còmhla ri cuid de na daoine aig an robh Arabais. Chùm mi an uair sin bùth-obrach còmhla ri ochdnar bhoireannach bho dhiofar dhùthchannan air feadh an t-saoghail agus dh’innis mi dhaibh mun Ghàidhlig. Dh’iarr mi orra innse mu dheidhinn faighinn sgoil ann an cànan ùr. Thug sin dhomh tòrr bheachdan airson an sgrìobhaidh agam fhèin agus beachdan airson an taisbeanaidh mar pìos fuaime. Aig an aon àm dh’innis mi sgeulachd mu bhalach a dh’fhàg an taigh aige gus dol dhan sgoil nas lugha na mile air falbh bhon dachaigh aige far an deach a bhualadh airson an cànan màthaireil aige a bhruidhinn. Bha sin stèidhichte air sgeulachd m’ athar. Chuir mi seachad trì làithean ann an Inbhir Nis a’ bruidhinn ri a phiuthar, m’ antaidh Rona (Lightfoot) is a’ clàradh pìos math den chòmhradh mu òrain is abairtean. Ag obair còmhla ri neach fuaim cruthaich mi pìosan de fhuaim an do sgrìob mi, còmhradh agus bàrdachd, agus a brosnachadh dòigh a dh’fhaodadh ealain lèirsinneach an sgeulachd innis. Nuair a thoiseach sinn rehearsals, dh’obraich sin suas na sgeulachdan sin thairis air tri lathaichean ach aig deireadh a latha rin sin co-dhùnadh nach cumadh sin air adhart leis a sgeulachd seo or cha robh an actair neo a choimhearsnachd leis an eòlas ceart dhen chanain Arabach neo eòlas a bhidh mar neach-fògarrach còmhla rinn anns a rum rehearsal. Ach tha mi cinnteach gu n e seo sgeulachd a tha mi ag iarraidh leantainn san àm ri teachd còmhla ri coimhearsnachd. Thug mi ri chèile diofar beachdan airson am pìos obair agam a bha stèidhte air an obair a rinn sinn. Bha (1) Ceilidh Pàipear – far an dh’ fhuair an luchd-èisteachd fiathaicheadh airson pìosan de mapa, a bha air reubte, a teip-eadh ri chèile a-rithist. A sealltainn nach urrain dhut rudan a’ chuir ri chèile ceart, neo ann an dòigh a bha e, as dèidh a bhristeadh, aig an aon àm a coimhead air faclan bhon àrainneachd agus ainmean-àite. 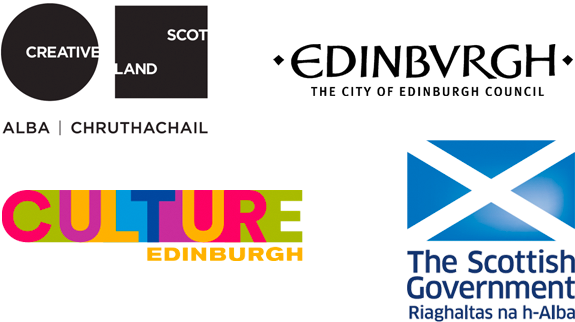 Cleachd sin bocsa-solas airson sealltainn fuadach ann a dòigh lèirsinneach as aonais cànain (1) cruth-tire – an chumaidh atharrachail Alba (2) inc dhubha – co-fhoghar le làithean sgoile, ainneart, milleadh de shealladh-tire agus cogadh (3) tectonic plates – a co-theacsa a tha air atharraicheadh tron eachdraidh Alba. Chuir sin air àrd-ùrlar diofar pìosan gluasad (1) stèidhte air am bàrdachd Ochd ceud ochd air fhichead uinneag mu dheidhinn Grenfell Tower agus na fuadaichean ann a Cataibh (2) slighe goirid à sgoil airson atharrachadh mòr (3) An Chrìocharan - aon-theangaich mu dheireadh. Cleachd sinn fuaim bho Tidelines, pìosan bho m’ antaidh agus mo mhac (3) seann clàradh de mo sheanmhair Bean Earsaidh Raghnaill Cha till MacCrimmon. Coimhead mi air diofair dòighean a dh’fhaodadh Gàidhlig a thuigsinn a cleachdadh ‘speech-bubbles’ agus sean pìos teacsa Imrich an t-Sathairne gu Tuath. Aig deireadh an latha cha do lean mi ri a sgeulachd a bha mi ag iarraidh agus ‘s e deagh rud a bha seo, gun fheum thu ag ionnsachadh, gu bheil na feadhainn a th’ aig eòlas cudromach. Bha mi toilichte gu b’ urrain sin sealltainn diofar dòighean de beachdan airson tuilleadh obair a dèanamh air. During the 4-6 weeks period prior to the rehearsal, I started to make some decisions about what the final sharing work would address. Two key themes emerged for me. The first was around the poem Chat written by Mohammad XXXX a refugee from Syria. I had this in English, Arabic and Gaelic. I wanted to explore the ideas around loss of language when you leave a piece of land, never to return. I was increasingly making links between the refugee experience and the Gaelic experience of clearance, schooling through English and educational migration. I was lucky enough to be introduced to an interfaith group in Glasgow and I was invited by them to a social event before Christmas and I got to meet a few families and chat with them. I performed the poem in Gaelic with some members of the group who spoke Arabic at this event. I then went on to hold a workshop with 8 women from different countries from across the world and introduced them to Gaelic and asked them to share their experiences of going to school and speaking in a new language. This informed a lot of my writing and ideas for the sharing aswell as a sound piece. I was running a parallel story of a boy who left his home to go to school, less than a mile from his home, only to have his mother tongue beaten out of him. This was loosely based on my father’s story. I spent three days in Inverness speaking with his sister, my aunty Rona (Lightfoot) and recording a lot of her conversation on the subject and songs and sayings. Working with a sound artists I created some sound pieces and I wrote dialogue and poems aswell as developing a visual and physical language to tell the story. When the time finally came for rehearsal we spent three days working up these narratives – only to take a decision not to pursue the story as we didn’t have the performers or community members with the right experience of the Arabic language or the experience of being a refugee in the rehearsal room with us. However, this is definitely a story that I’m committed to telling in the future with community members. I was able to weave together a variety of ideas for the final sharing based on the rich ground that we covered. 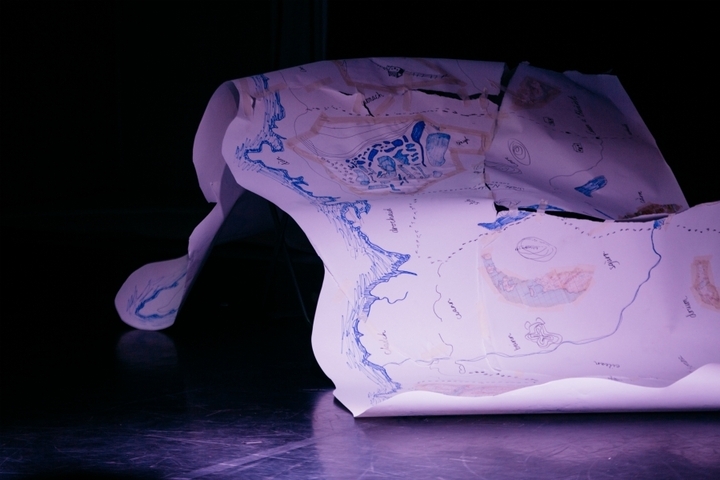 The elements were (1) Paper Ceilidh – where the audience were invited to piece together a Map that had been ripped up. An audience participatory element which demonstrated when you break something up, it can never quite get back to the way it was, whilst simultaneously looking at words in the landscape and place names. We used a Light box to show various elements of clearance in a visual way to avoid any language barrier (1) landscape – changing shape of Scotland (2) Black Ink – resonances with school days, violence, blot on landscape and war (3) tectonic plates – the changing undercurrent and perspectives of Scottish history. We had developed various dance pieces (1) based on the poem 826 Windows about people in Grenfell Towers and Sutherland Clearance (2) short walk to school but massive change (3) The changeling, the last monoglot. The sound we used was a combination of Tidelines, an edited bit of sound from the voice of my aunty and my son and (3) and old recording of my Granny, Bean Earsaidh Raghnaill Cha till MacCrimmon. I explored different ways that you can become more accessible in the language using visual speech bubbles and an old bit of Gaelic Text – Imrich an t-Sathurine gu Tuath. Objectively, I didn’t explore the story I wanted to and I feel it was an important lesson to learn, that you need the right people to tell it. I was pleased that we were able to show a diversity of ideas that I’d like to take forward.